It’s the holidays. You’ve already overindulged like crazy and might as well keep going until January 1st. Enough said. Or... you’ve started a new diet, a new meal plan, or a new fitness plan. You’re determined to be perfect at it. You’re determined to avoid the junk, to exercise every day, and to get that lifestyle you really want. You see a cookie. You’re hungry. You’re stressed. You’re tired. You’re frustrated. Your emotions start to take over and you allow yourself to slip up on your new plan. But, the cookie tastes amazing. So, you decide you’ll just eat one more. Fast forward 10 minutes later and you’ve had way more than you wanted, feel like a failure, and figure you might as well keep going and start again on Monday. Have you ever found yourself in a situation similar to the one I’ve described above? There are many times in our lives where we justify that “all you can eat” mentality and feel completely out of control with our eating habits. The holidays especially. And although I’m currently writing this post during the holidays, the techniques we’ll talk about today can be applied to any situation where you feel out of control with food or find yourself slipping down into the “all you can eat” mentality. So, before we move on, make sure to grab the guilt free holiday workbook that will help you navigate the 3 most common struggles we face when it comes to food: 1. Emotional and stress eating, 2. Free-for-all eating or lack of control with food, and 3. Feeling in control with food at parties and events. Now that you have your workbook, let’s dive in and discuss the steps to overcoming the “all you can eat” mentality. It doesn’t matter if it’s a special dish for the holidays, a candy bar for Halloween, or just a simple homemade banana bread recipe. You can have it whenever you want. Although there are times to mindfully enjoy some special dishes during holidays, most of the time anything you eat can be replicated again anytime of the year. When we have that discussion with ourselves it brings the stress of the holidays down several notches. Knowing that you can make stuffing anytime you want allows you to enjoy just enough for right now and not feel like you have to indulge in it. Try it. At your next party, event, or anytime you see food you want to indulge in, remind yourself that “the treat is always available to me”. It’s true! It takes away the novelty of a particular food and allows you to enjoy it in the present moment without overdoing it and feeling feelings of guilt, frustration, and failure. Whether or not it’s the holidays, try this the next time you are tempted to eat too much of a food you know you’ll feel guilty for overeating afterwards. Remind yourself that it’s available whenever you want it. Then, set a plan for how you’re going to eat it without going too far to induce guilt. Plan, plan, plan. It’s my #1 tip for success. If you can create an intention or plan for the holidays, for your next dinner party, or for your health and fitness goals, you’re so much more likely to stick to it. This is a similar process that athletes follow in their sport. They create a goal or a specific outcome they want. Then, they create their plan and visualize themselves performing the plan in real life, during their event. You can do the exact same for situations where you may feel worried or out of control with food. If you’re invited to a party, create a plan. Maybe it’s a plan to not go to the party starving because that’s when you’re most tempted to overeat. Or, maybe you plan to take a healthy dish that you love and are happy to eat. Or, set a goal to only eat one dessert instead of going back for more throughout the night. Set your intention. Visualize it. Act it out. This is where you’re workbook is going to come in handy. It helps you create that plan (with plenty of ideas and examples! ), learn how to stick to it, and debrief afterwards to celebrate successes and learn from mistakes. Lastly, food and emotions should not go together. Ok, let me rephrase that. Food and emotions should be a healthy relationship, and not one filled with guilt, frustration, and feelings of failure. In fact, the definition of emotional eating is eating in response to anything other than hunger. It’s ok that sometimes we eat when we’re not always hungry. Sometimes food brings a social gathering with friends we love and care about. Sometimes we celebrate big events by enjoying an evening out to dinner. Sometimes we want a candy bar for no other reason than it sounds good in the moment. I wrote an entire post about making peace with food and overcoming emotional eating. You can read about it here. I also have a free mini course all about helping you identify and overcome emotional eating. If you’re ready to take action, you can sign up for that here. We run into trouble when we respond to our emotions with food. Instead, the next time you find yourself running to grab food or all falling down that “free for all” trap, take 30 seconds to pause, think about the emotion you’re experiencing, and then come up with a plan that with help soothe the emotion that isn’t food. Maybe go for a walk, call a friend, do a hard workout, or watch a movie. Then, if you still feel hungry after dealing with the emotion, enjoy eating something mindfully knowing it’s not an instant response to your emotion. 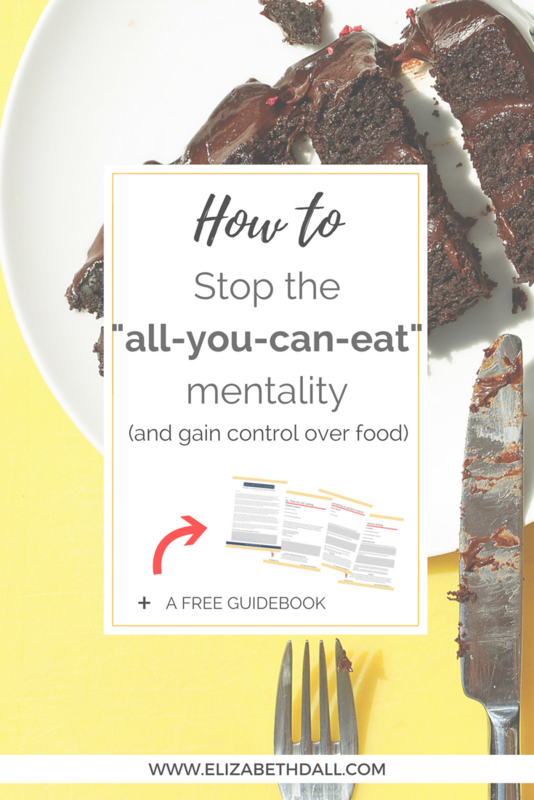 Now that you have 3 tips for stopping the all you can eat mentality, take action. Make your plan, set your intention, and then follow through. Remember that food is neutral. It doesn’t have any power over you unless you give it power. Be kind to yourself if you fall into the free for all thinking again. Notice your triggers. Notice your thoughts and emotions, then try again next time! It will come! And get your workbook to help you. Writing a plan down makes all the difference in how successful we are at sticking to something.